There is a thriving junior section with around 100 members that is growing rapidly. 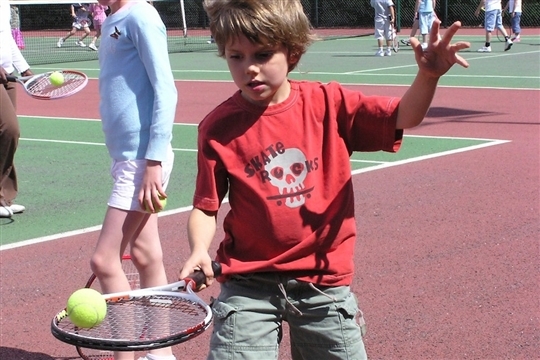 Junior members enjoy benefits such as subsidised Junior social sessions on Fridays, with mini tennis from 5.00 - 7.00 pm and from 7.00 - 9.00pm for children over 11. There are also development squads that play competitive tennis and have regular training sessions throughout the week after school and on weekends from the courts at Burntwood School. This is for juniors from as young as 4 all the way up to 17 years old. We also run box leagues to help our juniors take the first steps to playing competitive tennis as well as entering numerous team in to the AEGON League in the summer. If you would like to find out more about the junior programme, please contact James Higgs on +447931 806591 or james.a.higgs@gmail.com. During the holidays we run extremely popular camps from 09.30-1300 for children as young as 5 up to age of 13. Children will focus on the technical aspect of each shot over the course of a week as well as rallying and developing match tactics, all in a fun and friendly environment.